Kaine says his fellow Democrat cannot effectively serve and should step down. In issuing a statement Friday evening, Kaine broke from other party elders like Sen. Mark Warner and U.S. Rep. Bobby Scott, who did not directly call for Fairfax's resignation. Fairfax has denied wrongdoing, called for investigations and said he won't resign. Virginia Sen. Mark Warner is holding off from directly calling for Lt. Gov. Justin Fairfax's resignation after two women accused Fairfax of sexual assault. But Warner says the allegations against his fellow Democrat are serious and Fairfax should resign if they are true. "Sexual assault is never acceptable, and survivors of violence and harassment deserve to be heard. If these allegations concerning Lieutenant Governor Fairfax are accurate, then they are clearly disqualifying," Warner said in a statement Friday evening. The dean of Virginia's Democratic congressional delegation wants immediate investigations into whether Lt. Gov. Justin Fairfax sexually assaulted two women. Rep. Bobby Scott on Friday did not join the state's six other Democratic U.S. House members in calling for Fairfax's immediate resignation, but he said Fairfax should resign if investigations show either allegation to be true. The allegations against Fairfax come as Virginia's Democratic governor and attorney general are embroiled in scandals involving the past use of blackface. A Virginia lawmaker says he plans to file papers to begin impeachment proceedings against his state's lieutenant governor, who faces sexual assault allegations from two women. Del. Patrick Hope tweeted Friday that he would introduce articles of impeachment for Lt. Governor Justin Fairfax on Monday "if he has not resigned before then." Hope is an Arlington County Democrat who has served since 2010. U.S. Sen. Elizabeth Warren of Massachusetts is among the 2020 presidential contestants calling for the resignation of Virginia's lieutenant governor following sexual assault allegations against him from a second woman. Warren said on Twitter the "credible and troubling allegations" from the women accusing Lt. Gov. Justin Fairfax "make it clear" that he should resign. Her message came shortly after U.S. Sens. Cory Booker of New Jersey and Kirsten Gillibrand of New York called for Fairfax to resign. They join other notable Democrats like former Virginia Gov. Terry McAuliffe, who earlier Friday tweeted the "serious and credible" allegations have made clear Fairfax "can no longer effectively serve." U.S. Rep. Don McEachin, one of two black members of Virginia's congressional caucus, is calling for Lt. Gov. Justin Fairfax to resign. McEachin said Friday that Fairfax should deal with accusations of sexual assault from two women "as a private citizen." McEachin is a former top-ranking Democratic state senator. He's joined by five other Democratic U.S. House members from in calling for Fairfax to resign. Fairfax has denied the allegations and says he won't resign. U.S. Sens. Cory Booker of New Jersey and Kirsten Gillibrand of New York were first among the expanding field to call for Justin Fairfax's resignation. Booker posted on Twitter on Friday that "the multiple detailed allegations against the Lt. Gov. of Virginia are deeply troubling" and called on Fairfax to leave office. Gillibrand called details of the second woman's claims "sickening and horrendous" and also called on Fairfax to step down. The new accusation further clouds the fate of Virginia's government. Fairfax would take over if Gov. Ralph Northam were to resign over the racist photo that appeared on his medical school yearbook page. Northam told his top staff Friday that he would not resign. Attorney General Mark Herring, who is second in line of succession, admitted putting on blackface in college. A senior official in Virginia Gov. Ralph Northam's administration says the governor has told his top staff that he does not plan to resign over a racist photo despite intense pressure to step down. A Democratic lawmaker from Virginia's D.C. suburbs says won't call on the besieged governor to resign. State Sen. Chap Petersen issued a statement Friday saying he's spent the week meeting with voters to discuss the discovery of a racist photograph on the 1984 medical school yearbook page of Gov. Ralph Northam. Petersen's Democratic-leaning district includes Fairfax and Vienna. Peterson said he's concluded that he "will not request the Governor's resignation," nor that of any other official who hasn't obviously committed a crime in office or seen their ability to serve "irredeemably compromised." Many of the state's Democrats have called on Northam to step down over the yearbook photo, which shows one person in blackface and another in Ku Klux Klan attire. He first said he was in the picture, then denied it while at the same time acknowledging that he did wear blackface once at a dance contest. A hip-hop pioneer who was imitated by a Virginia politician in blackface says he hopes people will learn lessons from such "regrettable actions." He writes: "It is my hope that these regrettable actions can be turned into teachable moments." He doesn't mention Herring by name. 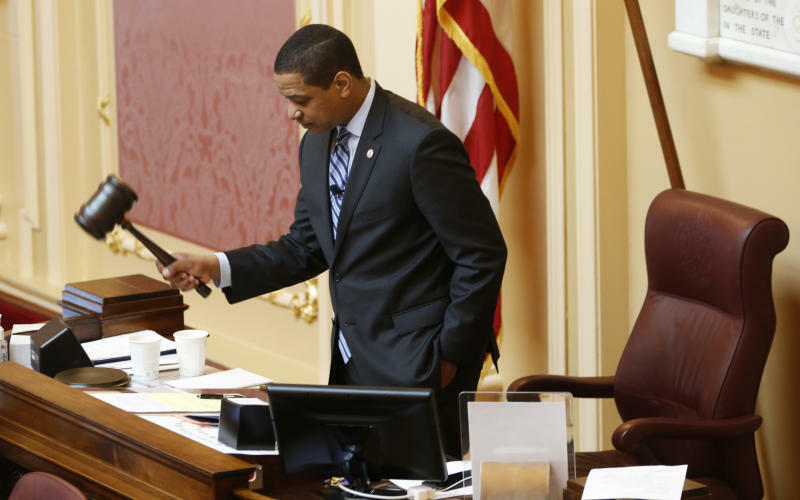 Virginia's House Democrats have followed the state's Legislative Black Caucus in not calling for resignations of the lieutenant governor or attorney general after insisting that the governor must go. Northam and Herring are struggling to affirm their respect for African-Americans after acknowledging they wore blackface once decades ago. A woman says Fairfax's possible promotion compelled her to publicly accuse him of sexually assaulting her 15 years ago in an encounter Fairfax says was consensual.